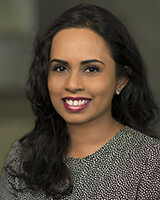 Dr Nirosha Paramanathan is a comprehensively and expertly trained General Ophthalmologist with interests in Cataract surgery, Paediatrics, Medical Retina and International/Developing Health. She obtained her Bachelors degrees in Medicine and Surgery as well as a post-graduate Masters degree in International Health, at the University of New South Wales. Dr Paramanathan, under the Royal Australian and New Zealand College of Ophthalmologists undertook 5 years of adult and paediatric Ophthalmology training at the Prince of Wales and Sydney Children’s Hospitals in Randwick. She is also, in addition to her current private practice undertaking further interest in strabismus and strabismus surgery under the guidance of renowned strabismus expert Dr Ross Fitzsimons. Dr Paramanathan enjoys practicing both adult and paediatric ophthalmology, within the advanced medical system available to most Australians, but is also committed to providing equal standard care to all. To this end, she has worked overseas in Burma and South America and is currently involved in developing a public ophthalmology service in Dubbo. She also continues to enjoy her commitment to teaching young Ophthalmologists-in-training at Prince of Wales and Sydney Children’s Hospitals. Dr Paramanathan prides herself in being an excellent clinician and surgeon as well as in giving her patients genuine and holistic care.